I'm not an expert on the herbaceous geraniums growing in my garden. Many are plants that I've picked out of mail-order catalogues, and forgotten their names soon after planting. I'm embarrassed that I've taken perennial geraniums so much for granted. 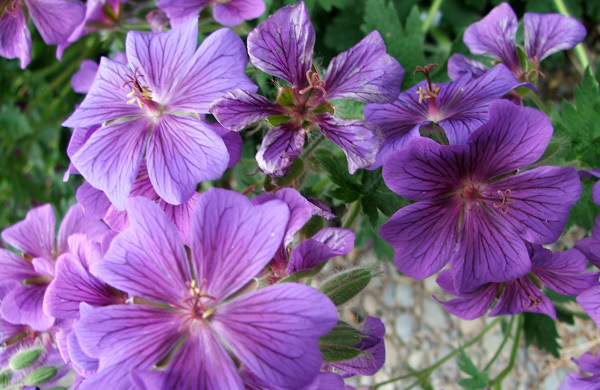 There are many different coloured geraniums on offer, apart from the original true blues. I have established clumps of a white flowering variety of geranium which I can see from the house in late spring. It soon gets straggly, though, and I trim it back to encourage flowering again. Further away in the Hen House garden there are patches of pink - all rejects from a friend's garden. 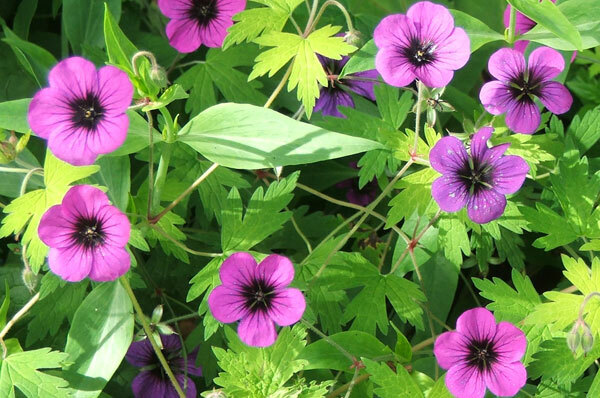 I also put up with Geranium phaeum, commonly called Mourning Widow, which I grow in the Apple Tree Garden. I seem to often be given herbaceous geraniums - another friend proudly gave me her clumps of so-called Johnson's Blue to look after. I wonder, though, if they are frauds - they are seeding everywhere, and I have always thought that Johnson's Blue is sterile. Anyway, they are filling in space in the Willow Tree Garden while their fate is decided. They certainly put on a great blue flowering display in summer, and again in Autumn after I've chopped them back. And I love the colour blue! 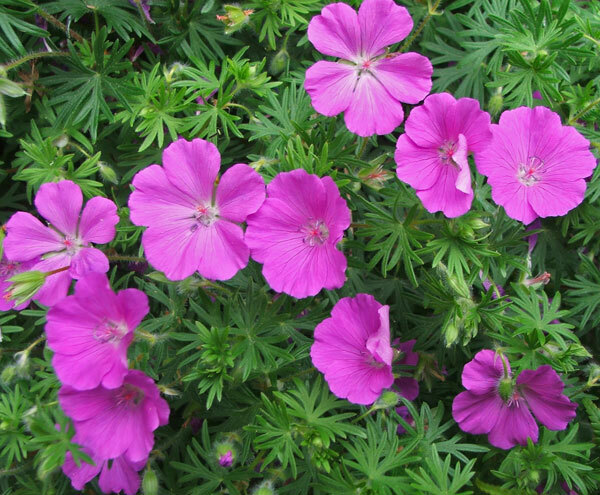 In the house garden these are clumps of a lilac flowering geranium with quite tiny flowers. This is a real beauty, and seems to quietly spread itself around - no dramas, though. Then alongside the paving path a beautiful hybrid with large veiny blue flowers delights in late spring. This also will reflower a bit if I trim it back. And I musn't forget to put in a vote for the fabulous foliage of perennial geraniums. Some leaves are delicate, others mathematical, but all are extremely beautiful. I grow one type with a dark red-brown coloured leaf, and another with beautiful fresh lime green foliage. Such variety, all from one plant!